We’re well into chili season now, and the only thing better than a hot winter chili is the leftovers. Last week I made a batch of vegetarian chili using Boca crumbles instead of ground beef; it made a quick and easy mid-week meal with plenty left over for one of my favorite guilty pleasure dishes: chili mac. 1. Sauté garlic and onion in olive oil for about five minutes. 2. Add all of the peppers and sauté for an additional 3-4 minutes, or until softened. 3 Add cumin through salt, stirring for one minute. 4. Pour in beer slowly and let settle. Add remaining ingredients through kidney beans, stirring well. 5. Let simmer uncovered for about 25 minutes, then add Boca crumbles and let simmer another 5-10 minutes. 6. Top with cheddar cheese and serve. *I just used whatever peppers were hanging out in the fridge. 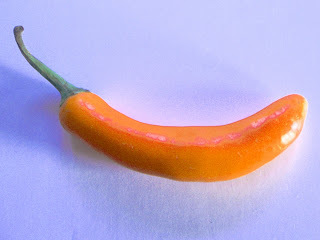 Any hot peppers will do: jalapeno, red chilis, or even scotch bonnets. I’ve even thrown in poblanos with great results. *The Boca crumbles are by far the best hamburger substitute I’ve tried, and it conveniently comes in three little packs of so you don’t have to use it all at once. Everyone knows that chili always tastes better then next day when the flavors really start to come out. For a satisfying chili mac I like to use my leftover chili and a creamy insta-mac and cheese like Velveeta shells. Just make it according to the instructions on the box, then mix in the chili and heat until warm and you have instant comfort food. Instead of Boca crumbles or any other name brand, I usually use TVP, which you can get, dried, in bulk at any health food store or co-op. 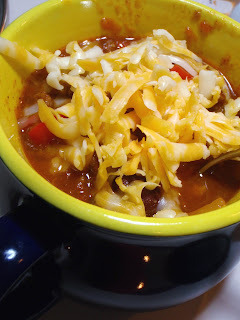 It really works great in chili because it soaks up any flavor and it's very convenient to keep around in the pantry. Anyhow, it's what they make Boca crumbles with! TVP=textured vegetable protein, or sometimes textured soy protein. It comes in big chunks sometimes, but the crumble size swells up about to the same texture and size as ground beef and is best for chili.